There are about 20 Santorini villages, ranging from busy tourist resorts, such as Fira and Oia, to traditional settlements, such as Vothonas or Exo Gonia, that only see the occasional tourist passing through. Fira: it clings to the edge of the cliff, which is in fact the rim of the crater. It’s about 300m over the sea level. Many visitors arriving with cruiseships are coming up the 525 steps from the old port of Fira, on foot, riding donkeys or by cable car. Noadays Fira is the cultural and commercial center of Santorini with lots of restaurants, tavernas, bars and nightclubs. It’s a picturesque village with white-washed houses, narrow stone alleyways and impressive Venetian manors from the 19th century. In Fira a visit to the Prehistoric and to the Archaeological museum is a must. Firostefani: is located 1 km north of Fira and it has been recently merged with the capital, so it’s not anymore a separate disctrict. 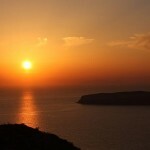 It’s famous for the stunning view of the Caldera and for its restaurants and tavernas. 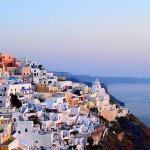 Imerovigli: is a charming village built right on the rim of the Caldera and just 2 km away from Fira. Along with beautiful views of the volcano, here one can find exclusive restaurants, charming buildings and luxury hotels. In Imerovigli there is a cape called Skaros, with a famous castle that guarded the western entrance of the island to defend it from the pirates, and was never defeated during the 600 years of its existence. Nowadays there are only some ruins. 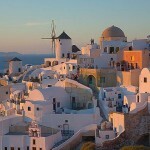 Oia: is the most glamorous and exclusive village of Santorini. It is known throughout the world for magical sunsets and its quite life. Build on the rim of the cliff in the traditional architecture with white-washed buldings carved into the rock, blue domed churches, narrow streets and capitan’s houses. Kamari: it is the product of the rapid tourist development and that’s why it is full of hotels, bungalows and rooms for rent as well as tavernas, bars, cafes and souvenir shops. The beach is close to the village and its sand is black with pebbles as in most Santorini beaches. Water sports, horse-back riding and wine tasting organized by a local winery are common practices for tourists. Perissa: it is yet another sea-side village. It has a long black sandy beach, which is great to look and hot to lie on. There are all the usual water based activities plus a regular water taxi to take you around the island to the white and red beaches and to Kamari. The village is lively with lots of retaurants, beach bars and nightclubs, as well as the beach of Perivolos which is the extention of Perissa. Pyrgos: built on the top of the highest hill in Santorini enjoys stunning views of the entire island and the surrounding sea. It’s a wonderful place to visit with its labyrinthian streets, many small churches and picturesque little cafés. Emborio: it gets its name from the Greek word for trade (Emporeio), and was the traditional trade center of the island for centuries. It’s the largest village in Santorini boasting old windmills on the hillside, narrow whitewashed alleyways, gorgeous blue domed churches, a 3rd Century BC sacred site to a pagan goddess and a ruined medieval castle. Megalochori: it is known for its large stretches of vineyards. The majority of visitors come here for some Santorini Wines, but also to enjoy beautiful views of the island and the caldera. 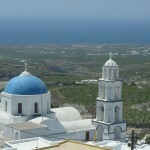 Akrotiri: it is a small traditional Santorini village that surrounded by an old Venetian castle. It’s a real gem of the island well worth visiting for the views, the Archaeological museum (excavation site), the 14th century Venetian castle, the red and white beaches and the lighthouse. Karterados: Karterados is another picturesque village of Santorini, very close to the capital of Fira (1,5 km away). What’s impressing with the traditional settlement of Karterados is the fact that the houses were built in a ravine, so most of them look like they’re sunken into the ground. A walk through the narrow streets will definitely give you an idea of the village’s glorious past, when some of the best captains lived there with their families. There are a lot of impressing chapels and churches, perfect for a visit or photoshoot.